My main takeaway from this trip was that I totally underestimated the impact it would have on me personally. I knew THEY would be blown away by our farm and Hornington Manor our family estate. I knew they would love bottle feeding a baby lamb. I knew that when they saw our factories and product development lab they would be very impressed. I knew that my partner Simon and his team of Darren and Graham would really help them fall in love with our products and brand. I knew that all of us drinking beer together in a pub called the House of Trembling Madness would connect us in a meaningful way. And I knew that sightseeing in London would be a total blast. What I didn’t realize was how each of those people would leave a lasting impression on me. When you travel with a group like that and the people are totally awesome and everyone is having a great time, you bond in a unique way. Not only that but getting to do this with my wife Bridget was perfect. Three years ago when I came back from England for the first time, I told her I wanted to leave Leggett and Platt to bring Spink and Edgar to the United States. She never hesitated and has supported me from the very beginning; even at times when I had doubts. After seeing what makes this product and brand so special, she loves the adventure we are on so much more. Getting to spend that time with her and see it through her eyes was really incredible for me. The Awesome Cockfosters in front of Buckingham Palace. 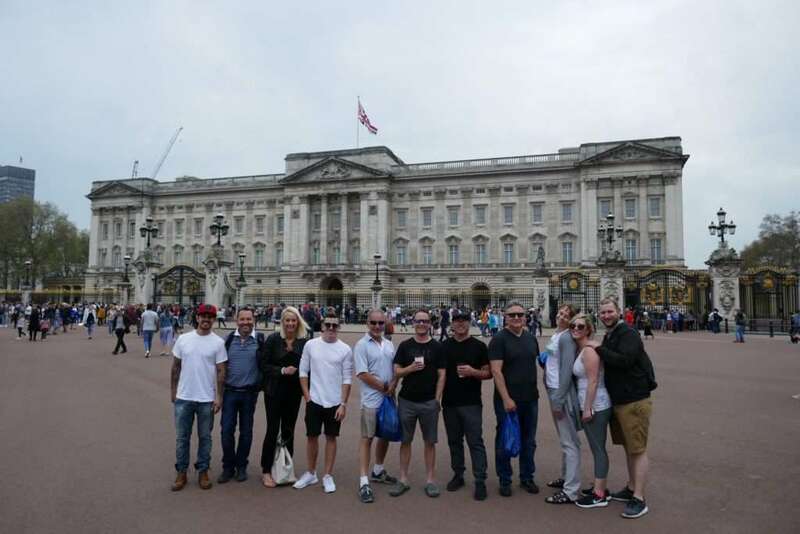 SURPRISE ENDING: Towards the end of our trip we were standing in front of Buckingham Palace on the Queen’s birthday. Darren, Simon’s right-hand guy announced to us that Harrison Spinks (the main company that owns the farm), was just awarded TWO MORE QUEEN’S AWARDS. That makes four total Queen’s Awards! To win just one is a HUGE deal in the United Kingdom so my hat is off to everyone at Harrison Spinks that made this happen. I am incredibly grateful because it gives us a lot to talk about over here in the U.S. Enjoy your time with the Queen and when you pick these awards up please give her a little smooch from me. I know the passion of selling a brand of mattresses you truly love. I haven’t deviated from the brand I love in nine years. It’s important to me to put my customers into a mattress that will outperform the rest. Mattresses need to provide a physical benefit for our customers. I found this blog well written with passion and excitement. Your share proves great memories can revolve around mattresses. This blog also leaves me curious, I’ll definitely be researching Spink and Edgar. Thanks Lisa for reading and for the feedback. Passion is sort of a big deal and when you have it, things happen. 🙂 Let me know if you have any questions! HAHA SISTER! You are always welcome.